Mystery, intuition, inner-knowing, self-trust, spiritual insight, emotional stability, divination, esoteric wisdom/knowledge, things yet to be revealed, your higher-self, spirit guides, discovering your own truth, a single woman; a chaste woman; morality, sanctity. Information withheld, secrets, misusing spiritual gifts, not trusting your intuition, being lied to, not listening, immorality; misusing your spiritual gifts, blocked intuition. Psychics, mystics, healers, teachers, mentors, nuns, therapists, spiritual coaches, psychologists, researchers, genealogists, librarians, spa owner/staff, mediators, educators. This table assumes you are following the Rider Waite-Smith ordering of the trumps, otherwise 11 will relate to Strength as seen in the Crowley-Harris Thoth and Tarot de Marseille decks. As shown in my Major Arcana Correspondence chart, the High Priestess has no specific timing associated with it. This is common for the cards that have planetary associations and not zodiacal ones. The High Priestess is secretive by nature, she is the Keeper of Secrets, and so it may be said that the timing of an event associated with her is also a secret, or hidden from you. This can be for a number of reasons, perhaps not all factors are in place for the event to be successful; perhaps it unsafe for you to know the timing in advance – interaction too early may negate the result. And finally, perhaps it is the will of the gods, or your higher power to withhold timing for reasons we cannot fathom or are not permitted to know, at this time. If we do want to look for timing though, and you just cannot wait…. the High Priestess is associated with the moon, which works on a 28 day cycle. To me, the High Priestess represents the New Moon – the one hidden from us. However, the moon works in 28 day cycles and so timing can be suggesting at fourteen or twenty-eight days from the date of the tarot reading. The element of water gives us no real clue as to the timing as it reinforces the hidden nature of the Priestess. From numerology, we have 2, 11 and 20 associated with this card and so either of those numbers can be suggested as a day or date. I will warn you that being that specific can get you into trouble if the event fails to occur at the time predicted, especially with the High Priestess. Beware the red herrings because if you are not meant to know, she will make sure you don’t. Who do you trust most in this world? Is it your partner? Your father? Your sibling? Your doctor? It ought to be yourself. If you cannot trust yourself, how can you possibly hope to grow? This may sound easy for me to say to you, but think about it for a moment. Everything you have accepted that you’re not good at is based on your lack of self-trust. Every time you say to yourself, “oh I’m no good at that”, or, “things just never work out for me”, you are disarming your potential to be good at it because you’re not trusting yourself to ever be good at it. You’re robbing yourself of the opportunity to improve, to grow and to change. And that’s a shame. Your intuitive gifts are your radars through life and they’re no good if they’re blocked or switched off. What can you do to change that situation? Can you learn to undo years of disbelief? Maybe not overnight, but you can begin to believe and then trust that there’s another part of you that you’ve silenced who can help you. She is your Higher Self and your inner Priestess. When you welcome her back from behind the Veil, she can begin to reveal your inner strengths to you. By beginning to trust in her, and ultimately yourself, you re-open the channel to the Divine Source. And when that happens, magic happens. Subtle at first, but then stronger and more vivid until you catch yourself one day – you’re not doubting yourself anymore, you’re trusting yourself and you feel great. This can begin for you right now. All you need is one tarot card, the Priestess. Meditate on this card, gaze upon it and ask her to help you begin the process. Opening to trust can change your life. Let your inner Priestess help you. Reading another person’s perspective on a card is always interesting. When I did an online tarot reading I got just that and so I posted it on my blog. You can read another take on the High Priestess in Free Online Tarot Readings, Do They Work? 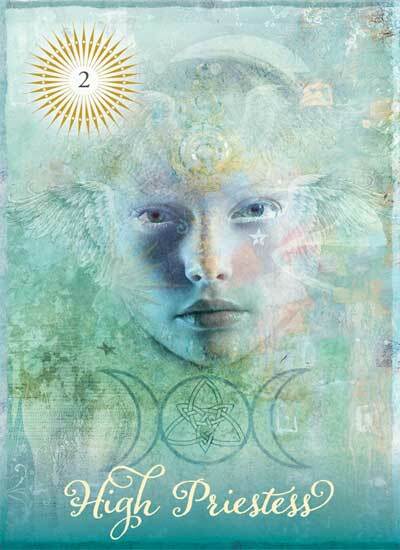 The Gaian Tarot – An Interview With Joanna Powell Colbert depicts some of Joanna’s favourite cards from her beautiful deck, and how she interpreted them in her own way. You can see and read how she depicts the High Priestess in this enlightening interview with her.